Like feeding the birds but don't want a mess on the ground? 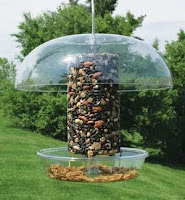 I recommended the following combinations of food, feeders and accessories so you can enjoy feeding your birds and have a tidy backyard, too. 1. 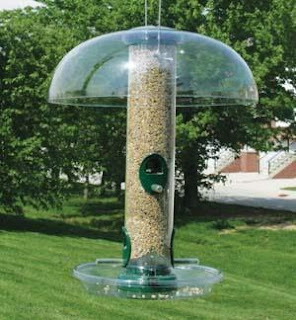 Mounted on an Advanced Pole System® setup, the WBU Recycled Plastic hopper feeder with the Recycled Plastic Catch-A-Seed Tray and filled with WBU No-Mess Blend allows tidy feeding combination that will attract an incredible variety of birds. Our unique No-Mess Blend features seeds that have had their shells removed so only the meat of the seed is left. No shells left on the ground and nothing will grow under the feeder. . The Recycled Plastic feeders are made of recycled milk jugs. They won’t crack, fade or rot and have a lifetime guarantee. 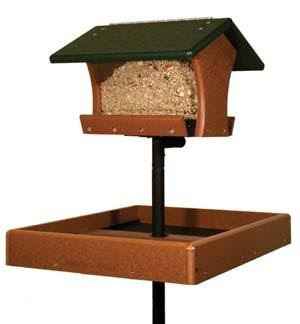 The Catch-a-Seed Tray prevents seed from falling to the ground and serves as a second feeder for birds like Cardinals. 2. For a compact, yet versatile tidy feeding station, we recommend offering WBU No-Mess Blend in our WBU Quick-Clean™ Seed Tube Feeder with a WBU Weather Guard and WBU Seed Tray. All of these come with a lifetime guarantee. Simply fill the WBU Dinner Bell with seed, WBU Seed Cylinders, mealworms or other food and enjoy the birds as well as a tidier feeding station. The WBU Dinner Bell is also backed by a lifetime guarantee.